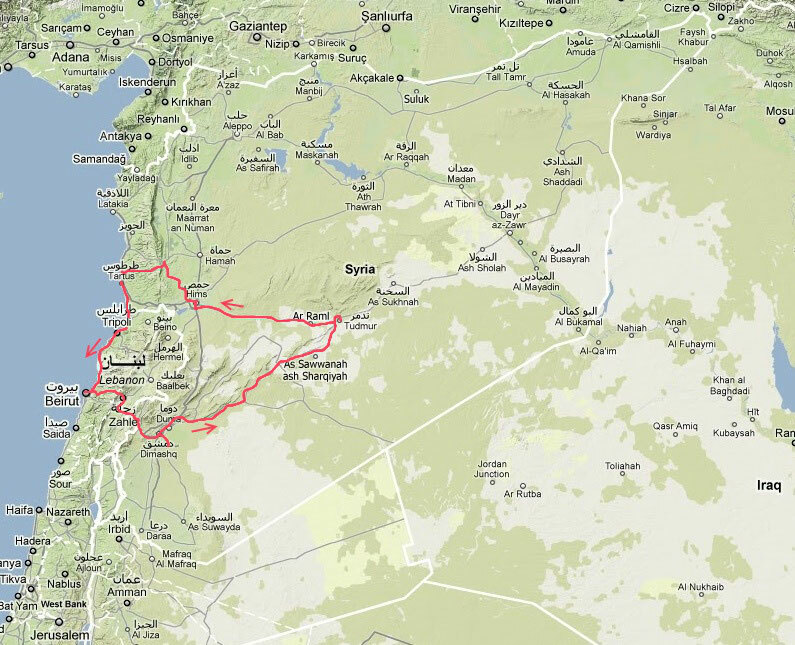 884 km bicycle trip in the Middle East starting in Syria´s capital Damascus crossing the desert to Palmyra and westwards via Homs to Tripoli at the Mediterranean coast in Lebanon, heading south to the capital Beirut and back to Damascus in Syria. Do you like Cycling Syria & Lebanon? Share Cycling Syria & Lebanon! (608 km, 3,267 metres in altitude) At 3 o'clock in the morning I landed in the capital Damascus, grabbed my bike from the box, arranged all bags and waited until it became light. At 6:30 am I started cycling, very tired because of lack of sleep, to the center. It took a while to finally find a suitable hotel with a free room. It had no window and was dirty, but finally I got some sleep! Then I walked a bit through the old town and the markets. I would have plenty of time to take a closer look at the city, if I would be back in two weeks, so I started cycling the next morning, relatively annoying through traffic out of Damascus to the northeast. I was quickly surrounded by barren desert and deserted spaces! At lunchtime I stopped by two truck drivers, who invited me with great hospitality to dine with them in the shade under their trucks and have tea. Strengthened, I thanked me with some supplies from Damascus, said goodbye and cycled further northeast through the desert. Thanks to tailwind I was not even so late after 162 km in Al Busayri, where there were only five houses, a gas station and two restaurants, but no hotel. But I was offered a place to sleep in a room with many carpets and mats on the floor, which I gratefully accepted. Until late I was sitting with some Syrians eating. Everyone, myself included, tried to talk as much as possible with their hands and feet and so we sat together for a long time until I fell tiredly onto the mat assigned to me. At night it had rained and in the morning everything was wet and cool. After breakfast, I drove off in long clothes. At noon I was in Palmyra, a famous ancient oasis city. I took a room and walked until sunset through the ruins, which were declared a UNESCO World Heritage Site, and of which I did not know that they would be taken only five years later by the so-called IS and destroyed to a large extent ! Although I felt sick the next morning, I walked for a long walk through the Valley of the Graves and up to the Qal'at Ibn Ma'n fortress, which offered a magnificent view of Palmyra. Weakly weakened, I ran back to the room, took my emergency antibiotics based on my diagnosis of giardiasis, and went to bed for the rest of the day, recovering. The next morning I felt a little better and so I started at 6.30 clock, straight through the desert to the west, later with a strong headwind exhausting uphill and downhill to Homs. After some back and forth I had found a room and waited here for Maria, who came directly from Damascus airport in the evening. We went to eat something together. I felt better, but Maria had something to eat now. Later she felt better again. The next morning we built Maria's bike together, packed all bags and started late together to the northwest in relatively strong headwinds and crosswinds. Therefore, we progressed rather slowly and were only in the dark on the rise to Masyaf. Also the next day it went partly exhausting steeply up and down, but through beautiful scenery to the Mediterranean coast. The last few kilometers we drove on the highway into Tartus. We walked through the city, went well mezze and fish and drank tea and beer by the sea. We talked for a long time. Finally it was much warmer at 34 degrees. The next day we cycled a few miles to the border and got our one-month visa for Lebanon in the passport. (228 km, 3,070 metres in altitude) From the border we cycled along the coast south to Tripoli. Maria did not really get better and so I walked alone through the city and the markets. The next day we cycled 54 km to Byblos, where we found no free and affordable accommodation and therefore took a small hut in Amshit at the campsite. In the evening we ran to Byblos and explored the place. The archaeological sites we looked at only the next day. From there we also climbed down to the sea and went swimming. The next day we cycled along the coast further south. On the highway we drove with a lot of traffic in the capital Beirut. We walked through the old quarter Gammayzeh and Achrafiye, in the beautiful residential area Saifi Village, to the still bombed Holiday Inn and along the promenade by the sea to the Pidgeons Rocks. In the evening we wandered through the nightlife of Beirut and were late in bed. The next morning we drove over busy highways to the east out of Beirut. Part of it went steeply uphill and it took forever, until we were finally surrounded by nature again. It went up unexpectedly long up to 1,615 m. In Zahlah we took a room and went really good Lebanese food. The next morning, the highway changed to 8 km to the highway, which was but little traffic. It went steadily, but not too steeply uphill on the border with Syria. 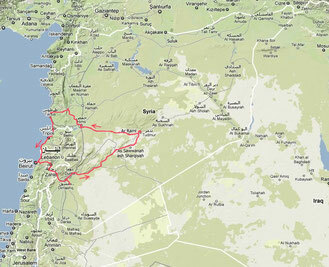 We crossed the border, cycled the last 48 km up to 1,250 m and then mostly downhill to Damascus. The following day we roamed Damascus, the markets and the mosques, packed our bikes and bags, and after another night, took a minibus taxi to the airport. The time had been too short! Only a few years after our departure, a trip like this was unfeasible in the long run due to years of war. It remained to be hoped that the people in these countries, especially in Syria, would soon be better!